Purina Pro Plan Veterinary Diets EN Gastrointestinal Dry Dog Food is a complete diet to help manage gastrointestinal and pancreatic conditions in dogs of all ages, including puppies. As intestinal disorders are frequently associated with poor digestion, Purina EN contains carefully selected highly digestible ingredients which help reduce the workload on the compromised gut and minimise the amount of nutrients that are not absorbed. 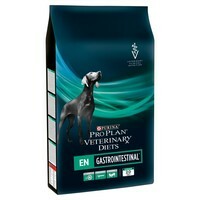 Purina EN is also highly digestible and low in fat which is particularly important for dogs with pancreatic conditions. It contains a type of fat that is easier to digest and absorb.